Champion Racing Association Powered by JEGS officials have added several names to the entry list for SpeedFest 2016, which will be held Jan. 30-31 at Crisp Motorsports Park in Cordele, Ga.
As announced earlier this week, 2015 NASCAR Sprint Cup Series champion Kyle Busch has added his name to the entry list for the 200 lap ARCA/CRA Super Series event, but that’s just the beginning of the talent that is entered for both events with SpeedFest 2016. Additional entries added for the 200 lap ARCA/CRA Super Series event include NASCAR XFINITY Series competitor Brennen Poole, 2015 NASCAR K&N Pro Series East champion William Byron, CARS Super Late Model Tour winner Brandon Setzer, Southern Super Series winner Casey Roderick, three time ARCA/CRA Super Series champion Scott Hantz, Red-Eye 100 winner Cole Anderson, 14-year-old Wisconsin racer Derek Kraus, Ron Young, Kyle Bryant, Scotty Ellis, Mason Massey, Derek Scott Jr., John Coffman and Todd Brown. Additional entries for the 125 lap JEGS/CRA All-Stars Tour event includes Scott and Roderick, who will both do double duty, Michigan JEGS/CRA All-Stars Tour regulars Andy and Phil Bozell, also 2015 Pro Late Model winners Justin South and Riley Thorton, Christopher Tullis, Connor Okrzesik, Adam Johnson, Joe Ross, Justin Ashburn and Hope Hornish, who will make her series debut at SpeedFest 2016 with hopes of capturing the series Rookie of the Year title during the 2016 season. These join the talented list of drivers already entered that includes John Hunter Nemechek, Bubba Pollard, Ty Majeski, Zane Smith, Harrison Burton, Steve Dorer, Donnie Wilson, Bret Holmes, Kyle Plott, Brandon Oakley, Wes Griffith Jr., Stuart Dutton, Chris Dilbeck, Dalton Grindle, Chandler Smith and Joshua James. 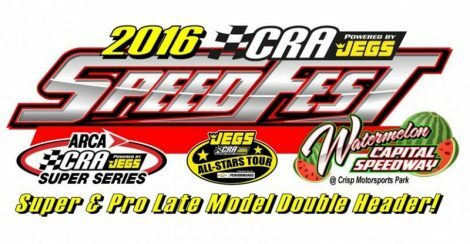 SpeedFest 2016 will once consist of a 200 lap ARCA/CRA Super Series special non-points event and a 125 lap JEGS/CRA All-Stars Tour special non-points event.